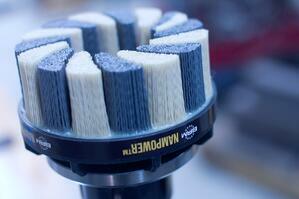 NamPower nylon abrasive disc brushes are available in two trim lengths: 18mm and 38mm. As a rule, shorter trim lengths are more aggressive and less flexible. Longer trim lengths are more flexible and can reach small holes and spaces, but these brushing tools are also less aggressive. NamPower disc brushes come in six different diameters: 50mm, 60mm, 80mm, 100mm, 125mm, and 150mm. For more aggressive brushing action, choose a larger-diameter tool. If a smaller brush is required due to fixture restrictions, the centerline of the brush tool should be aligned with the targeted edge with a minimum of 1” of overlap. NamPower disc brushes come in 80, 120, 180, and 320 grit. Coarser grits (80, 120) have larger particles and are recommended for heavier burrs, or when a finer surface finish is not required. If the starting finish is coarse but a fine finish is needed, begin with a coarse-grit tool and then use a fine-grit tool. Bristle density is also related to brush aggressiveness. 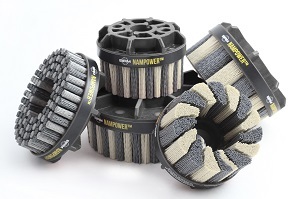 For more aggressive brushing action, choose NamPower nylon abrasive discs with heavy-density bristles. NamPower disc brushes with coarser-grit filaments can spin faster than finer-grit filaments without flaring and bouncing off the workpiece. Coarser-grit tools provide more aggressive brushing action, but many factors (including trim length and brush diameter) affect optimum disc speeds. Finally, NamPower discs that provide more aggressive brushing action run at deeper cutting depths. The NamPower Resource Guide provides complete information about all of the parameters you need to consider, and is available for download anytime.